Individuals who are covered under the 7-year warranty plan can enjoy 24-hour roadside coverage. Whether they need towing services to the nearest certified Mazda dealer or simply a jumpstart to get them going, Mazda has them covered. Mazda certified also offers a 7-year, 100,000-mile limited powertrain warranty. This feature covers many vital parts from the tip to the tail of the car. 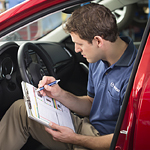 In addition, the Mazda certified program deductible plan allows participants to enjoy low cost repair services for a number of different vehicle parts and systems.